halloween decorations Archives - Hello, Kristina! 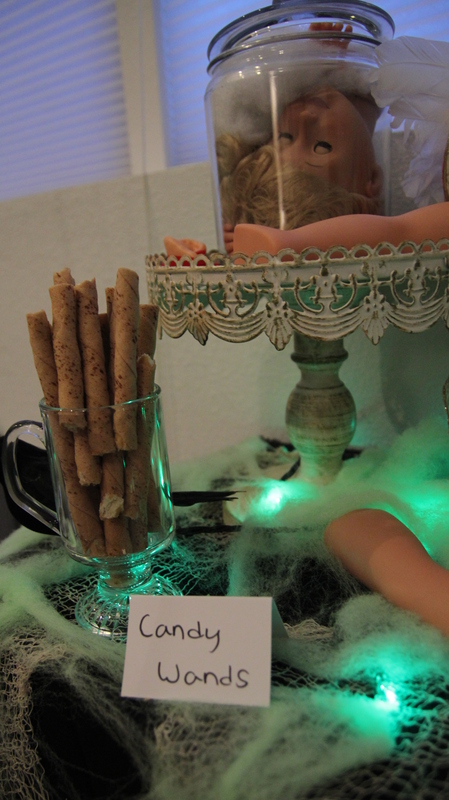 The candy wands were kind of an afterthought, to be honest. I bought a tin of Pirouettes because they have that tea party feel, and realized as I was setting them out that they could double as wands. 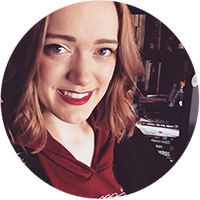 That’s the fun of throwing a themed party like this: the Harry Potter universe is so expansive that it’s really fun and easy to tie in just about anything. You’d be amazed how much of this stuff is entirely normal household items! From left to right we have sliced peaches in a light syrup, then the Eye of Newt bottle has yellow dyed water with sugar babies at the bottom to look like eyes. 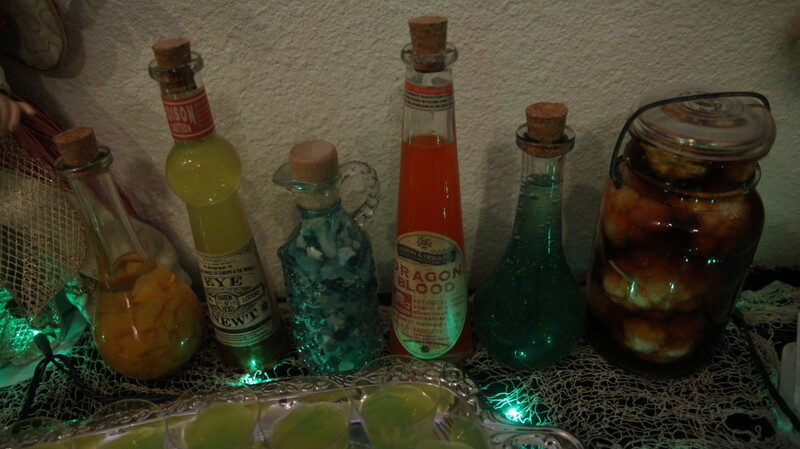 Next the fancier bottle has chopped up cauliflower stems in blue dyed water, and the Dragon Blood vial is simply Orange Crush soda. Second to last is an actual non-edible slime mixture, and finally the largest jar has cauliflower stalks and beef broth (which I thought looked a bit like cat brains). Now that you’re good and hungry (haha) let’s move on to food! These pastries ended up being kind of a mistake, but they worked out just fine in the end and were delicious as well! I meant to make little pastry purses but they all ended up opening while they were baking. 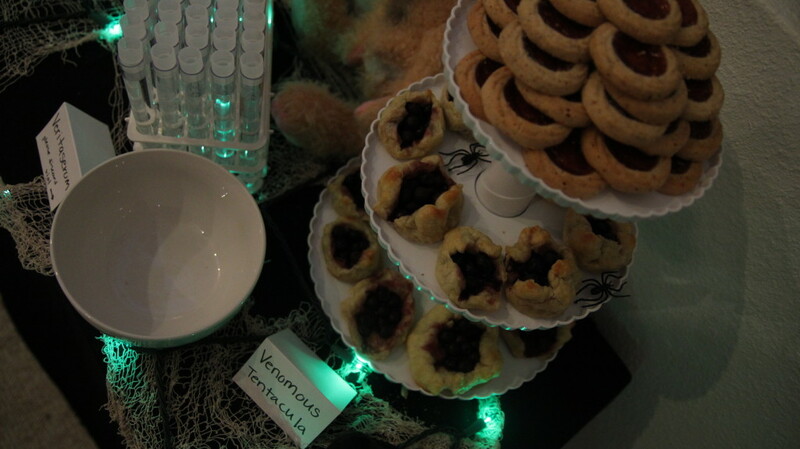 That was just fine though – I thought the blueberries wedged inside the flaky casing made them look like a sort of poisonous plant, so Venoumous Tentacula they became! 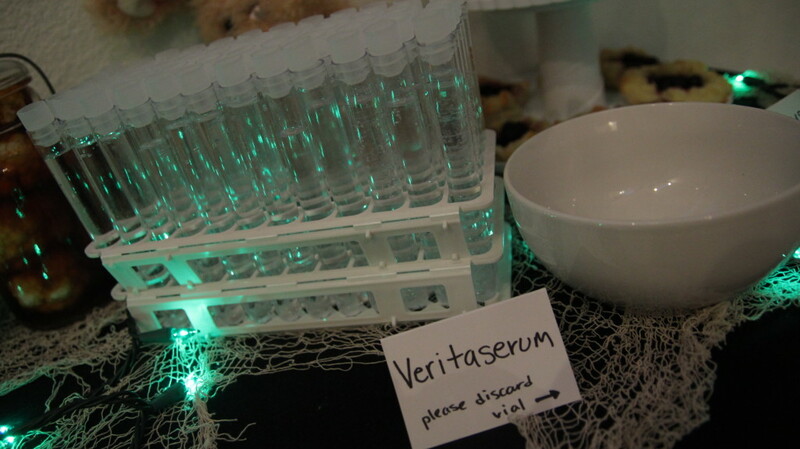 I was quite proud of the drinks at my shop: This first one came in these lovely test tube vials and were dubbed Veritaserum. The potion is always described as colorless, but I still wanted to do something fun with it, so I created a raspberry vodka and tonic water mixture (because tonic water reacts under blacklights). 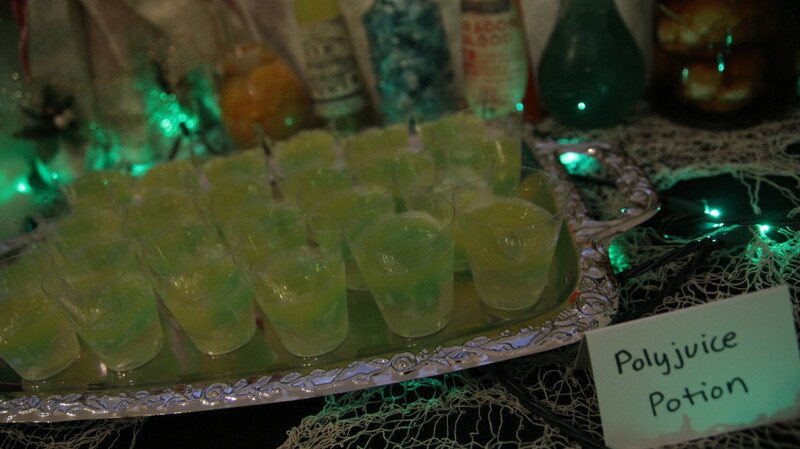 You can’t quite tell in this picture, but these drinks were a perfect addition to the glow theme at the party (and were quite popular for it). You can get the test tubes and rack here on Amazon. Just short of putting actual bits of things in the shots (no one wants to drink anything that has pieces of hair or fingernails in it, even on Halloween) we wanted to create a texture that still looked chunky enough to be Polyjuice Potion. These jello shots were a labour of love, creating three different colors of jello and spooning them into the cups separately after letting them firm up a bit. I used this recipe as a guide (though as cooking usually goes, they turned out a bit differently). Needless to say, the Polyjuice Potion was another popular item during the party, though we did hear they were quite strong. Whoops! 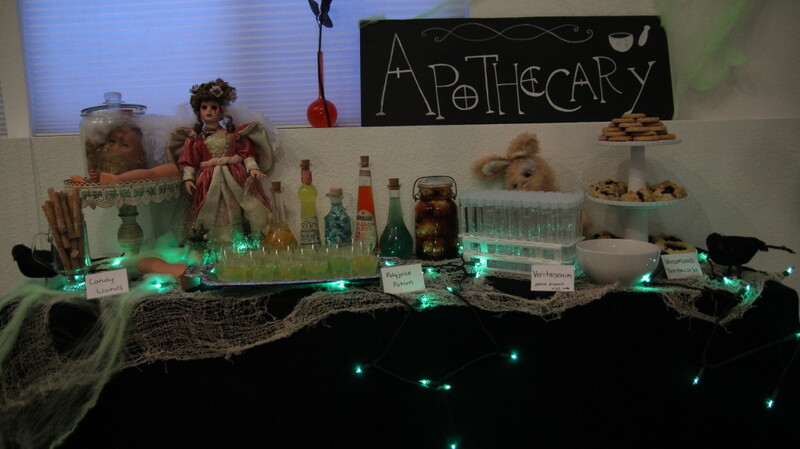 So, that was the Apothecary! There are still three more shops to feature, so please look out for those. I’m more than curious to hear your thoughts, and let me know if you’d like the recipes for any of the food items mentioned above!